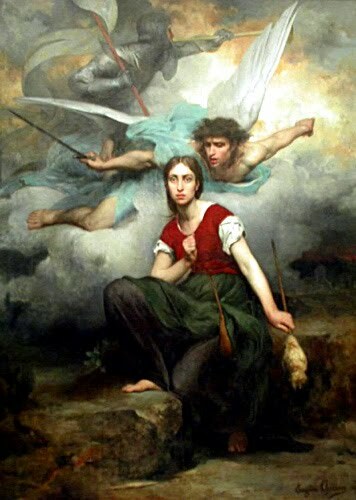 In Part I, Joan of Arc was last seen selling beans. One of the reasons why I think Joan is such a modern icon is because her rise and fall seems like a very twenty-first century tale. Joan is your typical American idol contestant. She is born into obscurity yet uses her force of nature to get her the Hollywood golden ticket – an interview with the king. From there, she keeps getting voted back until she puts on the show on the century - The taking of Orleans. The stage is set for greatness. But then her star begins to fall. Throw in a good Hollywood-like scandal when Joan is rumored to break her sacred sword over the back of a prostitute. Add a few military missteps and suddenly she is as popular as any tabloid-trashed, fallen starlet. That’s the Hollywood version. The real Joan of Arc doesn’t fit neatly into the pages of any glossy magazine. To start, life was much harder in Joan’s small village of Domremy. Born around 1412, Joan never learned to read or write or even ride a horse, and was never expected to do more than marry a good man and get fat with babies. If she was lucky, she would live past her childbearing age. If she was not, she would be dead by 25 like most women. Joan spent her nights under a modest slate roofed farmer’s house, huddled close together with her sister and brothers on a floor of cold pounded earth. In warmer months, she helped her father herd sheep in the fields that bordered a flowing stream strewn with poplars and willows. In colder months, her leathered fingers worked tirelessly helping her mother spin wool by the winter sun’s fading light. Joan rose and slept to the clockwork rhythms of the seasons, but she also had time to play. She danced with the village children under the shade of the Fairies Tree (a magical birch tree believed to have sacred healing powers) or raced them in foot races. (Joan was rumored to be the fastest in the whole village). In many ways, 15th century people were not so different from us. They had hopes and fears just like we do, but with life more fleeting, they came to the crossroads of where their hopes and fears met much sooner. Joan came to such a crossroad at around the age of 12 when she started to hear voices from Saint Michael. Michael didn’t ask much of her. He told her to be a good girl. Listen to her dad. Go to church. Then St. Catherine and St. Margaret stepped in and started asking for bigger favors. They told Joan to go save France. Crown Charles as king. It was all a bit much for a young girl and Joan tried to explain to her Saints that she was just a peasant girl. But that’s the crazy thing about saints whispering in your ear. The more you ignore them, the louder they get. It was at around this time that Joan decided to stay a maid and not to marry despite the fact that her father had already arranged a marriage with a local village boy. Joan’s finance even brought her to court over the matter. Joan won her case and shortly after the incident set her mind to the task at hand – saving a leaderless France. She first took a trip to Vaucouleurs to see Robert de Beaudricourt to convince him to take her to the Dauphin Charles VII. When Joan showed up in her patched red dress and thread-bare shoes claiming she was going to take Charles to Reims to be crowned, Beadricourt had a good laugh and then advised that her father give her a good beating. Joan returned home but was steadfast in her determination claiming that, “I must be with the king before mid-Lent, though I wear my legs to the knees on the road”. The following year she returned to see Beadricourt, but he still refused to take her to see the king. By now, word of the Maid who would save France was starting to get around in Vaucouleurs. 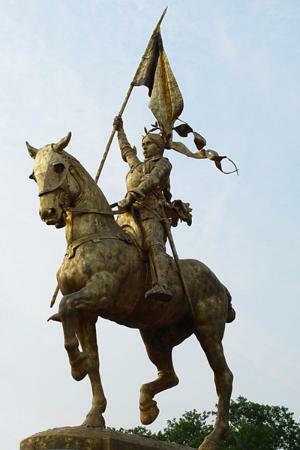 Joan then went to see Beaudricourt a third time and told him that it was imperative that they act quickly because the French army had been defeated at Rouvray that very day. This was news to Beaudricourt who had not heard of the loss yet. It was probably this prophecy that convinced him that Joan was not some crazy country bumpkin, but a true visionary. The only problem was determining whether her visions came from God or Satan. To make sure she was on the right side, he had her exorcized by the local priests. (this will come up later in her trial). Joan passed her exorcism exam with flying colors and was off to see Charles. But before setting off for her journey, Joan needed the right makeover for a woman about to enter a medieval military mission. Normally, the only women who traveled with soldiers were prostitutes and Joan wasn’t about to be seen as some cheap camp follower. So she cut her hair off and traded in her peasant garb for a tunic and trousers. Her prosecutors would later make a huge ruckus over her pants but it was also simply more practical for a girl about to endure countless riding over rough terrain to wear pants. Joan may have also felt that it protected her virginity to be seen as a man and not a pubescent girl. I love your series on Joan of Arc. Was there ever a portrait made of her in her time? It must of been very hard for a young peasant girl of that time period to overcome her own fears and training, to wear men's clothing, to push herself forward to a king, to lead military men. And for MEN of the time to listen to her! Back then women were worth less than a good horse. Her whole life story is so fascinating! She is a true inspiration for courage, and loyalty. I always thought that the "history books" (notice the sarcastic quotes) left a lot out when it came to Joan. They pretty much followed the "she heard saints' voices, fought with the French army, and got burned at the stake" story without talking about the trials it took to just get out her village. Yes, Mindy and Amy. Joan was really the property of her father. The movies don't do what she was up against much justice.